The San José Gold Project is located in San José Department, southern Uruguay, approximately 100 km north of the capital, Montevideo and 110 km east of the city of Colonia de Sacramento. The region features very subdued topography at approximately 100 m absolute elevation and is primarily used for cropping and cattle grazing on relatively small land holdings. Outcrop is very limited. The project is located over the San José Greenstone Belt (alternatively, the Florida Greenstone Belt), a 250 km long, east-west oriented, lower Proterozoic metamorphic belt (+/-2.1 Ga) comprising greenschist to lower amphibolite facies metasediments and metavolcanics with frequent large granitic-granodioritic intrusives. The geological setting appears typical of the terrains that host some of the world’s most prolific orogenic gold belts. Patagonia Gold SA has a strategic land position covering 49,000 ha of this poorly explored greenstone belt through an option agreement to acquire up to 100% of Trilogy Mining Corporation’s Carreta Quemada, Chamizo, Nueva Helvecia and Colla gold projects. Mineralisation manifests as chlorite-silica-sericite-pyrite altered metasediments and metavolcanics in shear zones 5-15m wide that are commonly located along the boundary of granodiorite plutons. The mineralisation may be analogous to the Birimian of West Africa. Detailed understanding of the geology of the greenstone belt is hindered by the very limited outcrop. 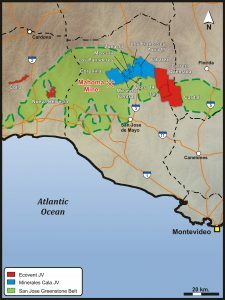 The San José Greenstone Belt has been subjected to intermittent exploration commencing in the early 1980’s with almost no systematic exploration work conducted during the last 20 years. Currently, the only operating gold mine in Uruguay is the San Gregorio mine in the Minas de Corrales area of northern Uruguay that commenced operations in 1997, exploiting shear hosted gold from a Proterozoic greenstone belt. The San Gregorio mine is currently operated by Orosur Mining. The Mahoma gold deposit, comprising auriferous quartz veins in granodiorite is located immediately west of the project tenure. Mahoma was discovered by Lac Minerals in the late 1980’s and exploited by American Resources Corporation during the 1990’s via shallow open pits. RC drilling at Zona 13 was carried out in June, consisting of two RC holes for a total of 122 m. Encouraging results (i.e. 13m @ 2gpt Au and 8m @ 1.2 gpt Au; RCZ13-01) confirm the eastward extension of the ENE trending Tambo Viejo Shear Zone (TVSZ), where it is intersected by WNW trending faults. Carreta Quemada: There appears to have been no exploration conducted over Carreta Quemada during the 1980’s and 1990’s. Trilogy Mining Corporation acquired an extensive tenement position over the area to the east of Chamizo during 2010, after detailed stream sediment sampling returned strong panned concentrate anomalies, up to 10,060 ppb Au. 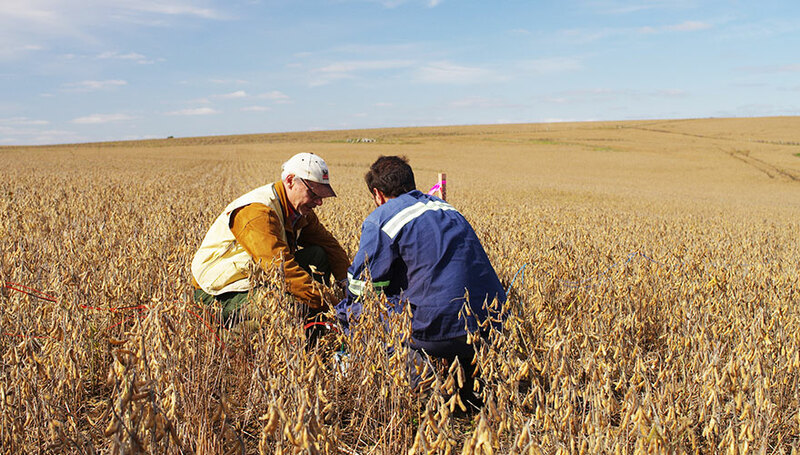 Subsequent soil geochemical sampling returned widespread gold in soil anomalies up to 1280 ppb Au and ground magnetics indicate a very structurally complex zone. A short drill programme has been carried out for the first time at CQ, consisting of three drill holes (DW 001 to DW 003) for a total of 486 m, and were placed along a 900 m long, NNE trending structural corridor coinciding with a chargeability anomaly. The geochemical results are encouraging and confirm the existence of a mineralised structural zone at depth (i.e best intercept from DW-001, 4m @ 1.65 ppm Au). Nueva Helvecia: The project is located near the town of the same name, approximately 40 km west of the Chamizo area. Stream sediment sampling identified visible gold during 1987 and shear zones and mineralised float with a very similar appearance to the Zona 14 mineralisation were identified. The exploration history is unclear but historical reports indicate that a 900m RC drilling programme during the 1990’s reported best results of 12 m at 2.94 ppm Au from 39 m in hole RCCR-04. Compañia Minera San José excavated trenches approximately 2 km to the north that intersected discontinuous quartz lenses with grades up to 57.3 ppm Au. Colla: Located approximately 20 km northwest of Nueva Helvecia, the Colla area was recognised to have potential in 1987 when an isolated outcrop of quartz-muscovite schist with iron oxides after sulphides returned elevated gold values. Trenches reported a best intercept of 2.7 m at 23.8 ppm Au. Six short holes were drilled in 1988, but recovery of the BQ core was very low in the shear zone and the best result reported was 5.75 m at 2.15 ppm Au. There has been no further exploration work at the prospect. The large strategic land holding in the poorly explored San José Greenstone Belt holds excellent potential for the conversion of known mineralisation into resources and for the discovery of new mesothermal orogenic gold mineralisation.